The TAR UC is committed to ensure the personal data security of all Users as required under the laws in Malaysia generally and the PDPA, 2010 specifically. The Internet, being an open environment, necessitates that the TAR UC shall not be able to guarantee and warrant that all data collected shall not be accessed, copied, disclosed, altered or otherwise tampered with. Contact information such as mobile and phone numbers, house address, email address and other contact details. TAR UC may from time to time send promotional materialson new or existing products & services, special offers, events or other information that the TAR UC is of the view that you may find interesting using the contact and other details which you have provided. TAR UC may also use your information to contact you for market research and surveys purposes. Any other marketing and promotional activities that the TAR UC is of the view that you may find interesting using the details which you have provided. The TAR UC shall not sell, distribute, lease or otherwise disclose any data collected herein to any other third parties save and except as outlined above or permitted by the User or is required by law to do so. The User’s personal information may be utilised by TAR UC to send promotional information about third parties which TAR UC is of the view that User may find interesting if the User allows for the same. Under no circumstances will the data collected be sold or manipulated in any way and for any other commercial reasons except as disclosed herein above. The TAR UC is committed to ensuring that any personal information collected is secured. In order to prevent unauthorised access or disclosure,the TAR UC has put in place, as the present resources and knowledge so permit, suitable and reasonable physical, electronic and processes to safeguard and secure the said information. The TAR UC use traffic log cookies to identify which pages are being used. This allows for data analysis about web page traffic in order to improve the website to tailor it to market needs. The information is for statistical analysis only and shall be removed from the system thereafter. A cookie shall in no way be used to access the User’s computer or any information about the User save and except the data the User volunteered to share. The User may accept or decline cookies. Most web browsers automatically accept cookies, but may be modified to decline selected cookies. This may, however, prevent the User from taking full advantage of the website. The TAR UC website may contain links to other websites of interest. Please note that the TAR UC do not have any control over that other Third Party website. Therefore, The TAR UC cannot be responsible for the protection and privacy of any information which the User provided whilst visiting such sites and such sites are not governed by this privacy statement. The User may request details of personal information which the TAR UC holds about the User under the PDPA, 2010 by sending such request via email to pdpa@tarc.edu.my An administrative fee shall be payable. In the event the User believes that any information of the User envisaged herein in the TAR UC’s possession is incorrect, inaccurate and or incomplete, please write to or email the TAR UC as soon as possible, at the above address or pdpa@tarc.edu.my for the TAR UC’s immediate and prompt action. The Tunku Abdul Rahman University College and its Holding Company the TARC Education Foundation (collectively herein referred to as TAR UC) is committed to ensure your personally identifiable information (personal data) be treated in accordance with the present legal and regulatory demands in force in Malaysia. This serves as a notice to you informing how the TAR UC may be processing and treating your personal data. The TAR UC processes your personal data such as name, identity card information, passport information, title, honorific, education background, records & performances and skills; contact information, mobile & phone numbers, house address, email address, mobile contacts like whatsapp, twitter, google+, viber, skype, wechat, facebook and/or linkedin; demographic information such as race, religion, gender, preferences and interests and financial background AND any other information relevant to you being a student, graduate, alumnus, staff, vendor, contractor, agent, partner or affiliate (whichever is applicable) which you have in the past provided and consented to provide and/or which personal data derived and arising out of your contract, contact/ relation with TAR UC. Internal record keeping and maintenance. Such process may include but not limited to updating and managing the accuracy of the TAR UC records. For the TAR UC products and services offer and/or improvement. 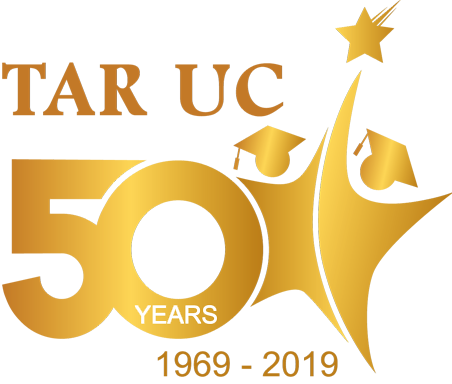 TAR UC may from time to time send promotional materials on new or existing products & services, special offers, events or other information that the TAR UC is of the view that you may find interesting using the personal data which you have provided. TAR UC may use your personal data to communicate with you. TAR UC may also use your personal data to contact you (for academic or market research and surveys purposes subject always to your express consent to participate in the same). Any other marketing and promotional activities that the TAR UC is of the view that you may find interesting using the personal data and details which you have provided. Prevention, detection and prosecution of Offences or Crimes, and compliance with legal, statutory, regulatory and contractual obligations. Maintain your academic, scholastic and disciplinary background (applicable to students, graduates and Alumnus only). Maintain your academic, scholastic, employment and disciplinary records (applicable to staff and former staff only ). Protecting TAR UC's interest and/or other ancillary and related purposes. Further, your personal data may be disclosed to the TAR UC’s strategic partners, professional advisers such as lawyers, accountants and auditors, governmental agencies and or vendors whether within or outside Malaysia directly or via their agents, representatives or servants for the Purposes. In certain circumstances, you may have provided the TAR UC personal data relating to others (such as spouse, parent(s), guardian(s) and/or sibling(s) for the Purposes. For thesepersonal data, you expressly warrant and represent to the TAR UC that you have permission, consent or assent from the same to provide such personal data to the TAR UC. We trust that you agree and consent to the above about how your personal data is processed by the TAR UC. You may request details of your personal data which the TAR UC holds about you under the PDPA, 2010 by sending such request via email to pdpa@tarc.edu.my and may also request for the correction, deletion and update of your personal data in the TAR UC's possession, which is incorrect, inaccurate and or incomplete provided always that your personal data under items (vii) and (viii) above shall not be applicable to this statement herein. An administrative fee shall be payable.